Yes a hunting license is less expinsive. But u can't get a license to hunt Bigfoot infact i believe they are a protected species!! Why would u protect something that doesn't exist?? Guy I have a couple of problems with this story as it is being told. Yes, I tried to watch that livestream that they did but couldn't stand the buzzing and never could see anything on the laptop that they were using for the visual part of it. I don't think that Bigfoot is going to try to kill anything, and I don't think that it would be disturbed by people if it were getting dinner either. I think it would have finished the kill and just walked away with the prey item. While I realize that the drawing was done by a forensic artist, it is still just a little too human for me to believe it, are they sure that they just didn't see a very tall person poaching? A sasquatch wouldn't kill anything or be disturbed by people? Only if its busy hugging rainbows. Are you kidding why wouldn't a bigfoot kill for food. What do you think they live off of dummy.its called the land like other animals do including humans and it would run because of us humans. They would make you get a special use permit for a lemonade stand or a unicorn convention out there, too. "Teresa uses only her first name, as do many Bigfoot believers, for fear of ridicule. She is an established spiritual medium and animal communicator from New Jersey." Right away, this smells like poo. When you have both Spiritual Medium and Animal Communicator on your resume, it's a %100 probability that your dealing with a nut job. 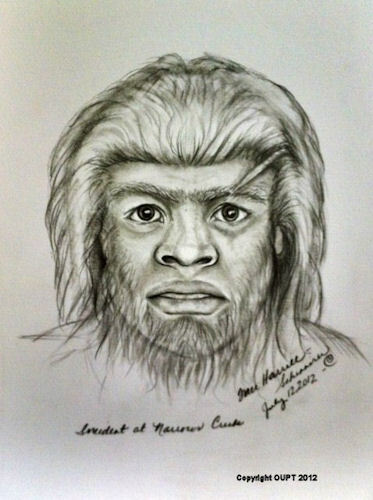 Besides being the only one of the group who happened to see a bigfoot that looks like the bass player for Prince, I'm sure she's the only one who has gone to Sedona and sat under a pyramid to feel the earth's harmonics. Bass player for Prince? That Bigfoot looks like Tom Araya of Slayer. Interesting account, sounds like a lot of fun with open-minded people. I'd have liked to join them. However, my skeptical side does lean toward the park service issuing the permit, not so much because they believe Bigfoot exists, so much as the desire for $150. I suspect, if I was willing to pay them $150, I could wander the forest and look for pretty much anything I wanted. You have to pay the fee if you are making money off the venture ..That's what the fee is about. That's the law. Pamela, you can wander the DBNF and look for anything you want at any time. It's public land. The $150 permit was an "event fee". Holly bat crap that was what the thing that took my friend looked like. Hey Sombody call Dave Paulides and have him get his team out there and look for them. It kind of looks like Dave doesn't it? Dont ya think its time u run a new story Guy? Looks like a human and better looking than many. Why the "apeman" adjective? Hairyness? Aren't we elitist. Poor guy. When any DNA surfaces it comes back in the human range. The "Yahoos" are the participants. It's very understandable why most people don't consider if a bigfoot exists , its the last thing most people want to consider when they venture for their two day outing, Large Populations Coastal areas seem to where many outdoor enthusiasts head for. I have been fortunate to have visited many of the national parks , Forests, to include the Cascades, all I'm saying is venture there and make it a couple of weeks. Now that's called Squatchin, but know this before you go, Some not all of them eats people! Squatchy would have taken his deer and left the scene in short order..